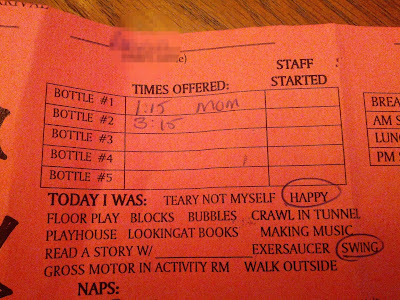 Today was Bookie's first day at daycare. I cuddled with her all morning. We went for a lunchtime walk together in the brisk, fall day. Then we took her to daycare, where I nursed her before we handed her to the very good care giver. As we said goodbye, she was in her new care giver's arms, pensively and calmly sucking on her pacifier. As we left the room, she didn't cry. I had to remind myself that the reason my husband and I were even able to be open to having a child right away is because of daycare, since leaving my job is not an option (nor is it a desire) at this point in our life as a family. Then off to work I went where I had a very productive three hours. Four hours or so after we dropped her off, we returned to pick her up. She was napping, and we were told she was fine the whole time. We received the above report (pictured) of her first day, which indicated that it was a good day for her at the daycare. Everyone couldn't get over her hair (my 2.5 month old daughter has a full head of thick brown hair, a good three inches long already). And she seemed her normal Bookie self as we strapped her into her car seat. Thank God today went well. Here's to hoping for more days like today.